Being new to the forest sector, I have to admit that today’s logging operations are quite different than the popular-culture image of a burly, bearded man wearing a plaid shirt and carrying an ax. Three recent firsthand experiences have provided me with a clearer picture of how logging is done in Oregon. The first experience was on private land, and my guide was forest industry veteran Pete Sikora of Giustina Resources. I couldn’t have asked for a better guide than Pete. Since I’m a newcomer to the forest sector, I appreciated that Pete didn’t use too many acronyms – and because he’s spent his entire career in the sector, he was able to tap into his knowledge and explain what I was seeing in a sustainably managed forest. 1) Safety is paramount in logging. 2) Technology is being used in new and unexpected ways to make logging more efficient and safe. 3) Careful planning and preparation are built into the process, to protect wildlife and water. My second experience was very different, because it was at Oregon State University’s McDonald-Dunn Research Forest for the Pacific Logging Congress Live In-Woods Show last month. 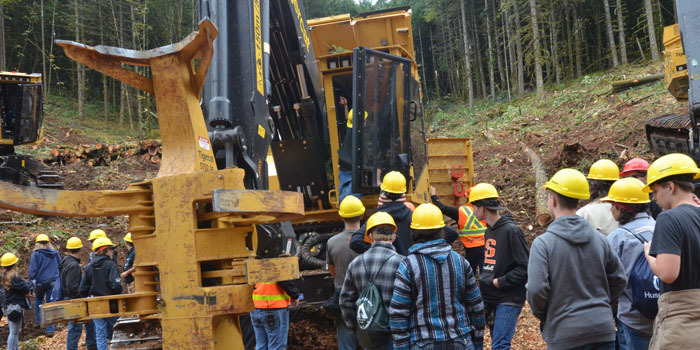 The event itself is a hybrid of trade show, forestry educational outreach and live logging equipment demonstrations. It took three and a half years to plan and execute. The impressive show was a testament to the hard work of all the event volunteers and sponsors who worked to bring the newest equipment, methods and loggers together to put on live demonstrations. 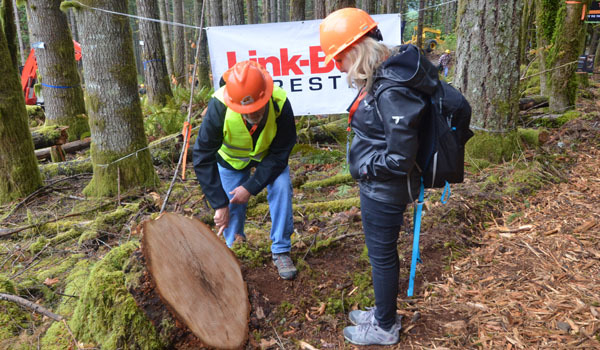 These demos showcased cutting-edge logging technology using automation, improved traction to protect soils from compaction, and even some aerial drones that assist with safety during tethered logging operations. One other takeaway I had from this experience was provided by the more than 450 high school students in attendance. The young men and women from across Oregon that I observed were engaged in the demonstrations, and excited by possible future careers in the forest industry. I was impressed to see them pulling out their phones to take videos of the demos. Finally, I recently spent a few hours in a small woodland with Matt Hegerberg, an OFRI board member and owner of Heron Timber. Matt’s operation didn’t have all the bells and whistles I saw at the Live In-Woods Show, but I was struck by how deeply he cares about his company and its employees. He and I discussed things like the efforts he’s taken to ensure his employees have family-wage jobs with health care and retirement benefits. I wish every Oregonian had an opportunity to see a logging operation up-close and personal. These experiences gave me a new and real point of reference. I find that in today’s fast-paced world, many of us don’t take the time to really understand something we don’t experience in our daily lives. We too often rely on the shorthand of pop culture, the media and other people’s opinions to shape our ideas. I guess I’m just another opinion to add to the mix, but I can tell you I didn’t witness anything unsafe, there weren’t too many bearded men, and I certainly didn’t meet anyone who didn’t view themselves as a steward of the land. There are a number of reasons building with wood instead of other materials can help reduce CO2 emissions, as Oliver points out. For one, trees absorb carbon dioxide and release oxygen as they grow. Carbon (the “C” in CO2) is stored in the wood of the tree. That carbon stays in the wood until the wood decomposes, at which time it re-binds with oxygen (the “O2” in CO2) and becomes carbon dioxide again. As a result, about half the dry weight of wood is carbon that once was CO2. That’s true of all things wood, including wood pencils, wood flooring, 2x4s and mass timber products such as cross-laminated timber (CLT). As a building material, wood typically has a long, useful life as it stores carbon that would otherwise be released into the air as CO2 – in some cases, as long as 100 years or more. And when a building reaches the end of its usefulness, it can be deconstructed and the wood products reused rather than being landfilled. For the sake of easy math, let’s assume a portion of forest is harvested and the trees are converted to wood products at age 50. In doing so, we’ve removed carbon from the forest, released some CO2 in the process (but not nearly as much as we’ve removed and turned into wood products), and stored that carbon in buildings and other uses for the wood. Then we plant seedlings to replace the harvested trees, and the carbon sequestration process begins anew in the forest. Fifty years later, we still have the vast majority of the previously stored carbon in the buildings we built half a century ago, and the new trees are ready to be harvested and milled into wood products. Now we have two times the carbon stored in buildings and wood products, and a new forest is planted and beginning the sequestration process again. As long as the buildings last longer than the age of the trees that are harvested, there is a net-positive carbon effect. Other building materials, primarily concrete and steel, don’t store any carbon, and they require far more energy consumption than is required to produce wood products. This results in increased greenhouse gas emissions. In fact, compared to making wood products, it takes more than nine times as much energy to produce steel, and nearly four times as much energy to produce concrete. Making concrete, for instance, involves heating limestone to very high temperatures, resulting in a chemical process called “calcination,” which amounts to about 50 percent of concrete’s CO2 emissions. This helps explain why concrete, the second most consumed substance on earth, accounts for around 5 percent of total global CO2 emissions. Carbon12, an eight-story condo tower in Portland that is currently the tallest wood building in the U.S., has 577 metric tons of CO2 equivalent stored in the wood it uses, and an additional 223 metric tons of emissions were avoided by choosing wood instead of steel and concrete. The First Tech Federal Credit Union office in Hillsboro, which at 156,000 square feet is currently the largest CLT building in the U.S., has 4,192 metric tons of CO2 equivalent stored in the wood, and 1,622 tons of CO2 emissions were avoided. That’s just two relatively small buildings. Imagine what would be possible if all our buildings were wood. But could they be? Besides its positive carbon story, wood is also the only renewable resource we have with which to build. We can grow what we need, and when we use it we can replace what we used. 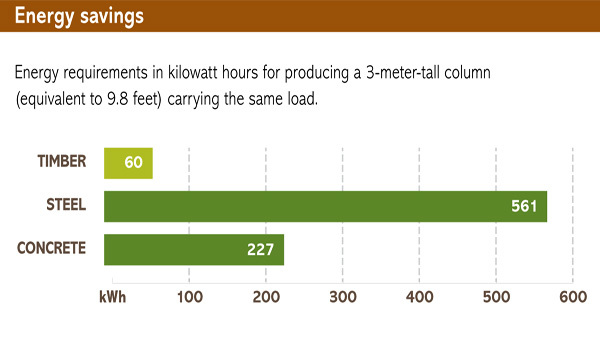 You might be surprised at just how productive our forests are. Timberland in Oregon (defined as forestland that is capable of growing timber and potentially available for harvest, excluding parks, wilderness areas or reserves) grows enough wood to replace the amount used in the First Tech project in 46 minutes, and enough wood to replace the amount used in Carbon12 in just 6 minutes. That means that without depleting natural resources, we can be constructing more buildings with wood instead of steel and concrete, as Oliver suggested at the Oregon Coastal Caucus, and help combat climate change in the process. The largest forestry education event in the country, the Society of American Foresters National Convention, is coming to Portland next month. This is your chance to rub elbows with some 2,000 forestry leaders from around the country and increase your knowledge on many aspects of forestry that are important in Oregon, the Pacific Northwest and the world. As a member of the Society of American Foresters board of directors, I’m excited to have the organization’s annual gathering of forest professionals held in my home state this Oct. 3-7. I’m also thrilled OFRI is a co-sponsor of the convention and that nearly all of our staff have gotten involved in some way, including helping to organize a tour and several breakout sessions and producing a new video that will debut during the opening session. The theme of the convention, which will take place at the Oregon Convention Center, is the intersection of science and policy in forest management. Attendees will be asked to explore how wildland fire policy is influencing forest management decisions, the role of scientists in informing forest policy, and ways to transform state and federal policy into effective natural resource management. You can find a full convention program here. The convention opens Oct. 3 with technical tours to several locations in the Pacific Northwest, including actively managed Coast Range forests and the site of last year’s Eagle Creek Fire in the Columbia River Gorge. OFRI has also organized a mass timber-themed tour that includes a visit to Freres Lumber Co.’s mass plywood panel plant in Lyons. That evening, the convention will feature an opening reception in the exhibit hall, where more than 70 exhibitors, including OFRI, will showcase the latest products, technologies and resources for forestry professionals. The Oct. 4 agenda will include the screening of a new OFRI video that showcases the pride of Oregon’s forest sector, from landowners to wildlife biologists. Oregon State Forester Peter Daugherty will also give the convention’s keynote address on forest policy and forest management. On Oct. 5, Julie has also organized a series of sessions titled “Connecting Students, Schools, Colleges and the Forest Sector” for high school forestry teachers, 50 of whom OFRI is sponsoring to attend the convention. A concurrent session titled “Critical Pathways in Forestry Education” was developed by OFRI Director of K-12 Programs Norie Dimeo-Ediger and Environmental Educator Rikki Heath for forestry professionals who want to work with schools and students. The convention concludes on Sunday, Oct. 7, with two more tours highlighting forestry in the urban landscape and forest habitat conservation plans. Even though it’s coming up soon, it’s not too late to register for the convention. We hope you can join us for some or all it. With smoke from wildfires filling the air over much of Oregon for weeks this summer, many people are asking what can be done to prevent the large, intense forest fires we’ve seen this fire season and in previous years, across the state and throughout the western U.S. Part of the answer lies in active forest management to reduce the fuels for fires and improve the overall fire resiliency of our forests, especially those located in the drier region of the state east of the Cascades. 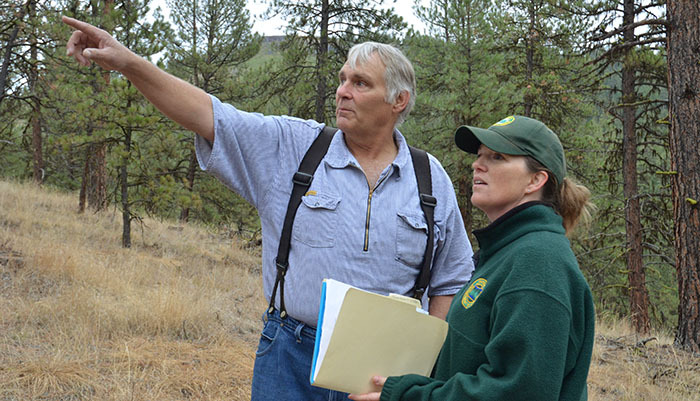 Since many of the individuals and families who own forestland in this part of Oregon lack the technical expertise needed to take steps that reduce the danger of a catastrophic wildfire on their properties, OFRI’s Landowner Education program is involved in a few collaborative projects that reach out to private landowners to engage them in active forest management. Such “All-lands” projects, which involve multiple landowners, public agencies and partners representing a range of different forest ownerships, are increasingly common. My involvement in these types of projects came about through my association with the American Forest Foundation, an organization that helps family forest landowners care for their forests. AFF is coordinating several conservation projects throughout the West that focus on reaching out to private landowners to get them involved in active forest management. In Oregon, these include My Blue Mountains Woodland, the original AFF-coordinated western outreach project. MBMW focuses on the northeast Oregon counties of Baker, Umatilla, Union and Wallowa. Partners include AFF, OFRI, Wallowa Resources, Oregon State University Extension, the Oregon Department of Forestry, Wallowa-Whitman National Forest and the Natural Resources Conservation Service. This project began with funding forest restoration on private lands adjacent to the Wallowa-Whitman National Forest, but has since expanded to reach out to unengaged private landowners throughout northeast Oregon, to encourage them to actively manage their forests. Landowners are invited to receive publications, join networks and have a professional forester visit and assess their property. 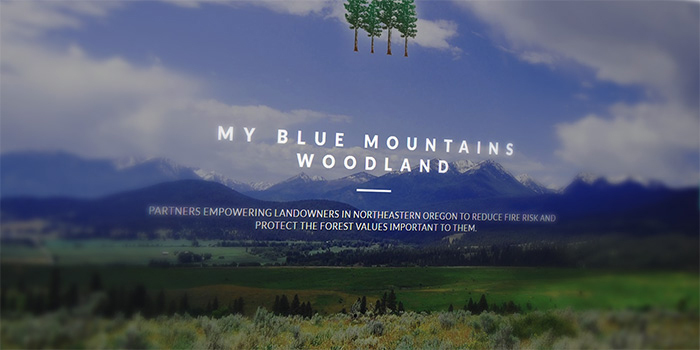 Two other landowner outreach projects modeled after MBMW that have been launched in Oregon are My Southern Oregon Woodlands, which focuses on the unique landscape and landowners in Jackson, Josephine and southern Douglas counties, and the Chiloquin Community Forest and Fire Project, which is based in Klamath County around the town of Chiloquin. OFRI’s role in these projects has been providing publications, helping fund development and mailing of outreach materials, supporting project coordination, and serving on the project advisory committees. We are proud to be part of the teams that are making a difference on private forestlands in Oregon. With the state experiencing worsening fire seasons, collaborative programs like these will help make our forests more resilient to wildfire across the landscape.